FAQ / Ask a ? Fixed annuities provide a guaranteed minimum interest rate and are considered savings instruments. Insurance companies issue all fixed annuities. They are not government or bank obligations, so naturally they are not FDIC insured. However, fixed annuities have an extraordinary record of safety and offer other benefits. Prior to the late 1970s annuities were primarily used as a retirement income vehicle. The textbook definition of an annuity in those days was “A periodic income for a specified length of time, for life, or a combination of the two.” Today, however, annuities can mean much more. Today, most people do not convert the money they have in their annuity into a guaranteed income stream (called annuitization); instead, they treat the annuity value they have accumulated as any other asset. Anecdotal evidence suggests that almost all of these accumulated annuity values are passed onto the heirs in a big lump sum and not turned into an income stream by the buyers of the annuities. The consensus is that less than 2% of deferred annuities are annuitized. Get up to 7.25% guaranteed returns with no market risk. Request a free personalized annuity comparison report now! Safe Money Places® and this website are operated by SMP International LLC. 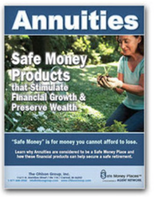 Safe Money Places is a consumer website. Safe Money Places is not a licensed insurance agency and financial products cannot be purchased on this website. Safe Money Places® does not warrant anything on this website, although we strive to keep everything accurate and up-to-date. ​We do not provide tax, legal, accounting, financial, or investment advice. You need to do your own homework and consult your own experts on your personal situation. This website is protected by applicable copyright laws. You may make or print one copy of any material for personal use, further copying or distributing is prohibited without prior written permission. If you have an questions or concerns, please contact us at 1-877-844-0900 OR contact us by filling out our form. Raymond J. Ohlson, CLU, CRC, is the CEO of SMP International LLC which owns safemoneyplaces.com. Mr. Ohlson is a licensed insurance agent in all states with the exception of New York. If you request information, regarding a product or service, you may be contacted by a life insurance agent licensed in your state. © COPYRIGHT SMP International 2005- 2019. ALL RIGHTS RESERVED.